Watch the exclusive Mr. Media interview with Joe Muto by watching the video player above! Mr. Media is recorded live before a studio audience of dittoheads, dunderheads and confederacies of dunces… in the NEW new media capital of the world… St. Petersburg, Florida! 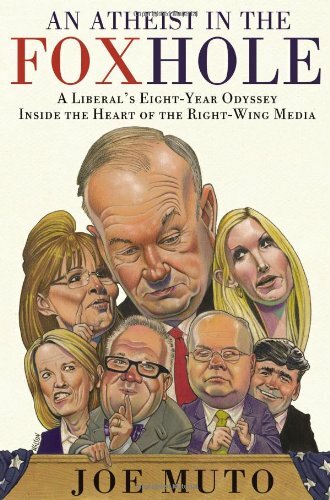 Order ‘An Atheist in the FOXhole: A Liberal’s Eight-Year Odyssey Inside the Heart of the Right-Wing Media’ by Joe Muto, available right now at a great price by clicking on the book cover above! The funniest thing about Joe Muto’s new book is that it took him less than 48 hours to undo an eight-year career as a TV producer at Fox News… and 323 pages to prove he was in the wrong business all along anyway. Looking for a great summertime read at the beach? Whether you’re lefty or a righty, whether you think Bill O’Reilly walks on water or wish he was swimming with the fishes, you’re going to be entertained, informed, and entirely astounded by Gawker Fox Mole Joe Muto’s first book, An Atheist in the FOXhole: A Liberal’s Eight-Year Odyssey Inside the Heart of the Right-Wing Media. You’ll laugh, you’ll cry… and then you’ll turn the page and do it again. Muto, who spent eight years mostly sublimating his liberal beliefs as he rose from production assistant in the dumpy Fox newsroom to producer for Bill O’Reilly on “The O’Reilly Factor,” tells a great story. He would make a smart advisor to Aaron Sorkin on HBO’s “The Newsroom”; in fact, he probably would have done well to tell his true story behind the scenes at Fox News as a Roman à clef —you know, disguising the facts in the same “Fair and Balanced” ways that Fox News itself does. The essence of Muto’s story is that after eight years of holding his tongue—and his nose—as a Fox News employee, something happened that he could simply not abide. He contacted the Gawker gossip website and became known as the “Fox Mole”—a career that lasted significantly less time than Anderson Cooper’s time hosting “The Mole” for ABC. Cooper’s mole work led to CNN; Muto’s brought him to Mr. Media. You do the math. You don’t have to love or hate Fox News to enjoy Foxhole—it’s just a good story, well told, with insight into the most confounding major network in American television history.